ER was the first of three children born to Anna Rebecca Livingston Ludlow Hall Roosevelt (March 7, 1863 - December 7, 1892) and Elliot Roosevelt (February 28, 1860 - August 14, 1894). Anna could trace her Livingston heritage back to the American Revolution: one relative signed the Declaration of Independence and another administered the oath of office to George Washington. The oldest of six children, Anna was raised in a household that demanded discipline and viewed playfulness as an affront to God. Although her education was limited to etiquette and religion, seventeen-year-old Anna was forced to take control of the family and help manage the finances after her father died suddenly without leaving a will. Respectable, charming, and a striking beauty, Anna quickly became the leading debutante of the 1881 season. 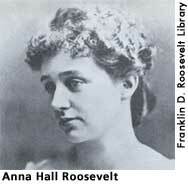 Within three months, Elliott Roosevelt had become enchanted with her. 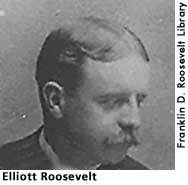 Elliott Roosevelt was the polar opposite of Anna: dashing, outgoing, volatile, and sensual; "an enormously attractive man bent on self-destruction. "( 1 ) He was a sickly child and his father, Theodore Roosevelt, Sr., grew so concerned about Elliott's health that he sent him to Texas, convinced that a man's health was more important than his education. Elliott would spend two years out west and then travel to India and the Himalayas before returning home to care for the dying father he adored. Yet Elliott was unprepared for adulthood without his father's guidance and discipline and, despite his good intentions, adopted a life more defined by parties and alcohol than banking and real estate. When Elliott Roosevelt married Anna Hall December 1, 1883, he was more bon vivant than junior partner in a real estate firm and had begun battling the depression that would plague him for the rest of his life. Joseph P. Lash, Eleanor and Franklin (New York: Signet Press, 1971), 71. Cook, Blanche Wiesen. Eleanor Roosevelt: Volume One, 1884-1933. New York: Viking Press, 1992, 38-79. Lash, Joseph P. Eleanor and Franklin. New York: Signet Press, 1971, 1-97.